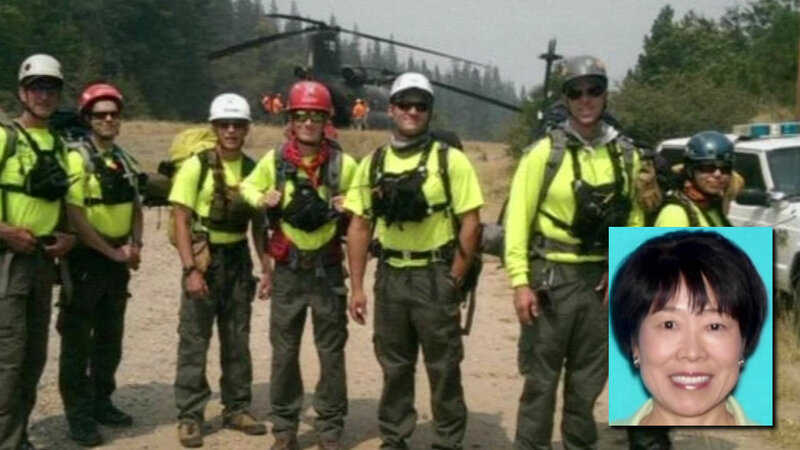 SAN FRANCISCO (KGO) -- An Orangevale woman missing for 9 days in the wilderness is thanking members of the search and rescue teams that saved her life. Miyuki Harwood, 62, is recovering in the hospital after spending more than a week alone in the woods. The 12-person Marin County Search and Rescue Team, who joined the effort with Fresno County authorities, found Harwood down a steep, rugged ledge. Thirty minutes after she was found, Lt. Doug Pittman got the call. "Just ecstatic. First of all, that the person was found, the person was safe and, in this case, my team had an opportunity to play a role in that," he said. Officials say Harwood managed to survive for more than a week in a remote area of the Sierra National Forest. Lt. Pittman says the mountain rescue team called Harwood's name. She responded by blowing a whistle. He says the whistle and a water filter likely saved her life. "If there's one thing you're going to need to survive a number of days as she did, it would be the availability of water," Pittman said. The rescuers administered first aid, then carried Harwood about a half a mile, to where a CHP helicopter could land. It flew Harwood to the California Regional Medical Center in Fresno to get checked out. Upon arrival at Fresno CMRC, Miyuki was in good spirits, but exhausted. She had surgery Saturday night to set the broken bones in her lower left leg. "She was conscious, she was talking, she's very, very grateful that she was found. She's grateful to all of the people that helped look for her. So we expect her condition to improve as time goes by," Fresno County Sheriff Margaret Mimms said. There are approximately 100 members in the Marin County Search and Rescue team. It is all volunteer and some members are as young as 15. Twenty of the members are mountain rescue certified.